Cabin & Layout: Qatar First Class, 1-2-1. Total of 8 seats. 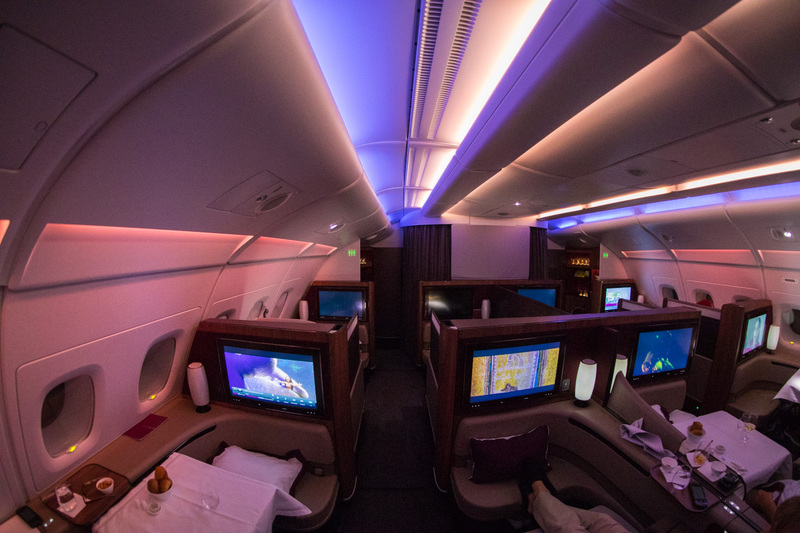 Qatar Airways first class is one of the rarest cabins of the Middle Eastern carriers, as you’ll only find it on 10 Airbus A380 aircraft (the rest of the Qatar Airways fleet tops out at business class). 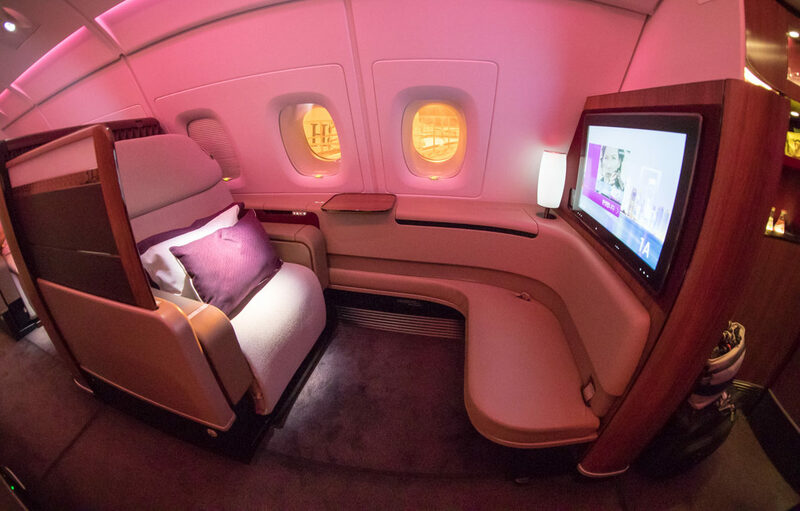 Some would argue that its new Qsuite business class is actually a better product than its first class, so before trying Qsuites I was keen to see how Qatar’s first class compares to the same A380 product on Etihad and Emirates. 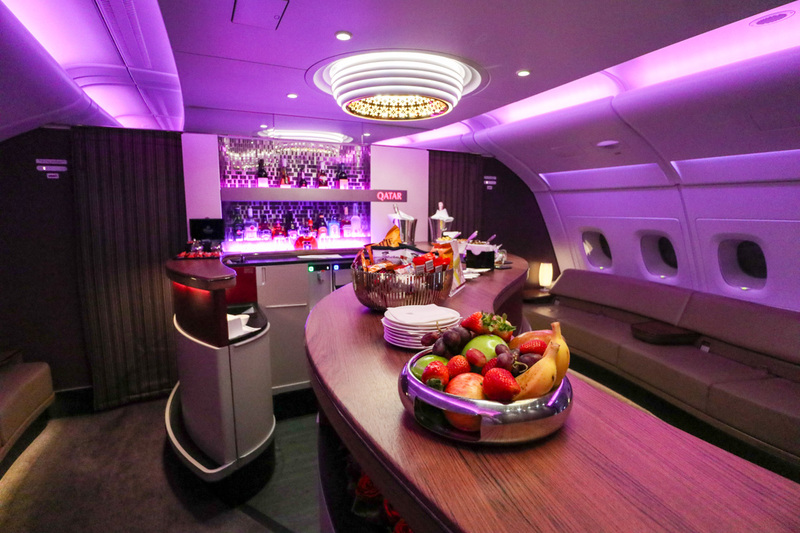 Considering business class reward seats out of Sydney on Qatar are incredibly rare, I decided to look for first class instead and had no trouble finding availability on the day I wanted to fly. 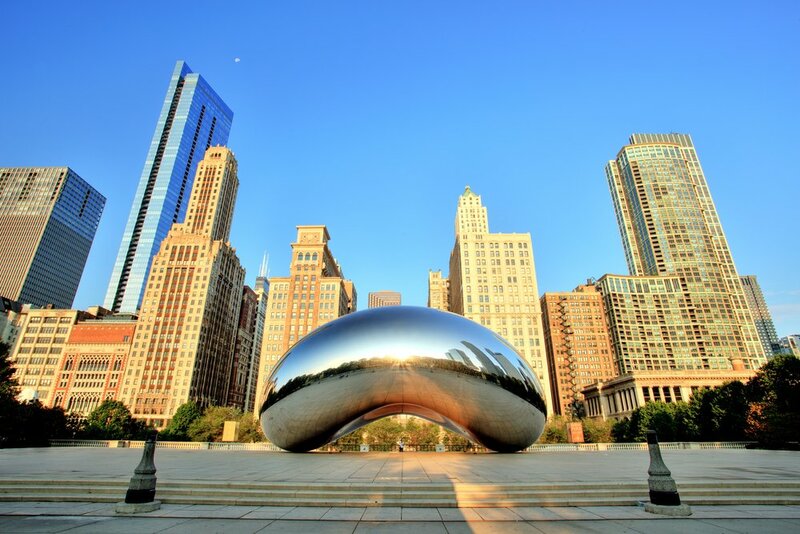 As a Oneworld member, I utilized Cathay Pacific’s Asia Miles program to make this booking and transferred 155,000 Amex points from my Business Platinum® Card from American Express to my Asia Miles account (of course, there are several other Amex cards that earn Membership Rewards points). 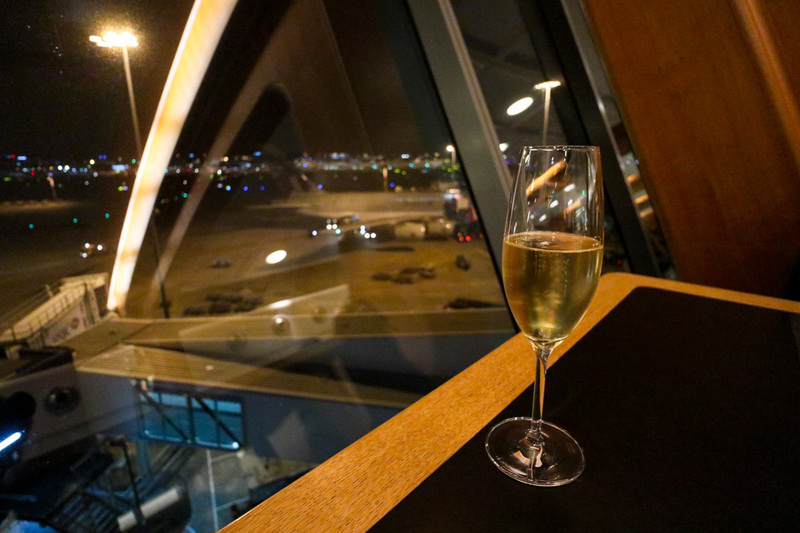 The 155,000 Asia Miles got me a First Class ticket from SYD > DOH, and then a Business Class ticket from DOH > FRA as there isn’t a First Class cabin on that latter route. 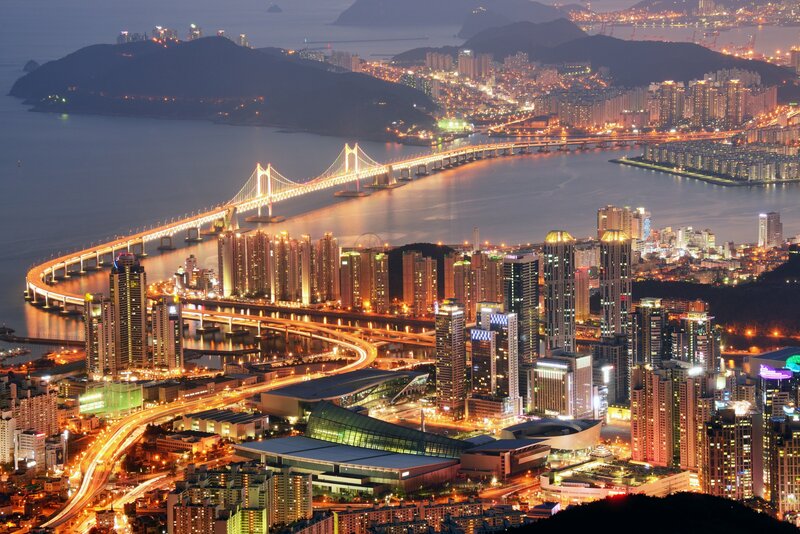 Due to the most recent changes at Asia Miles this redemption is now worth 220,000 one-way. 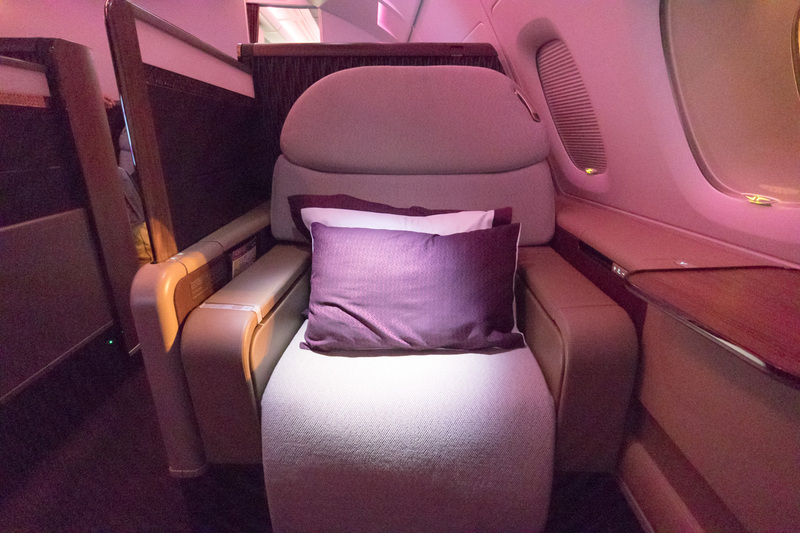 See our guide on earning lots of Cathay Pacific points if you’re looking to book this award flight. 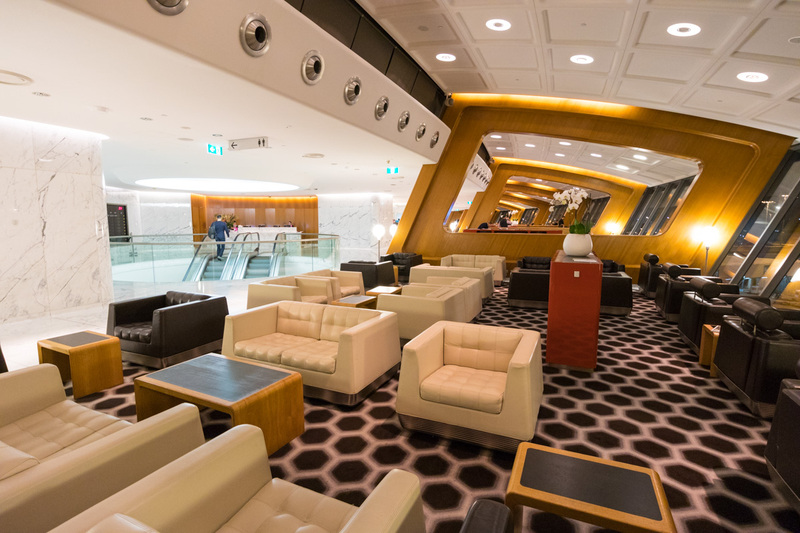 First class and Emerald-tier guests flying Qatar Airways out of Sydney can use the excellent Qantas first class lounge. Just present your boarding pass to the greeter. 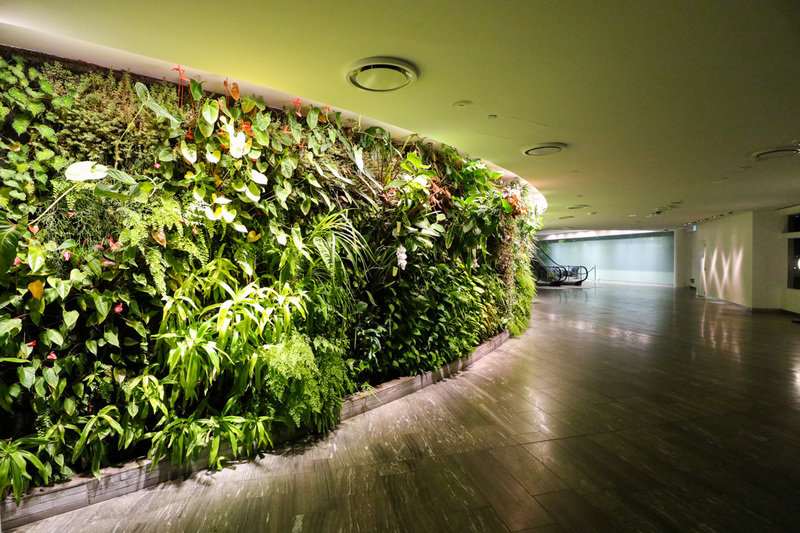 After they’ve checked your eligibility, you’ll enter the lounge and walk past a 30-meter vibrant green wall to take the escalators up to the main level. 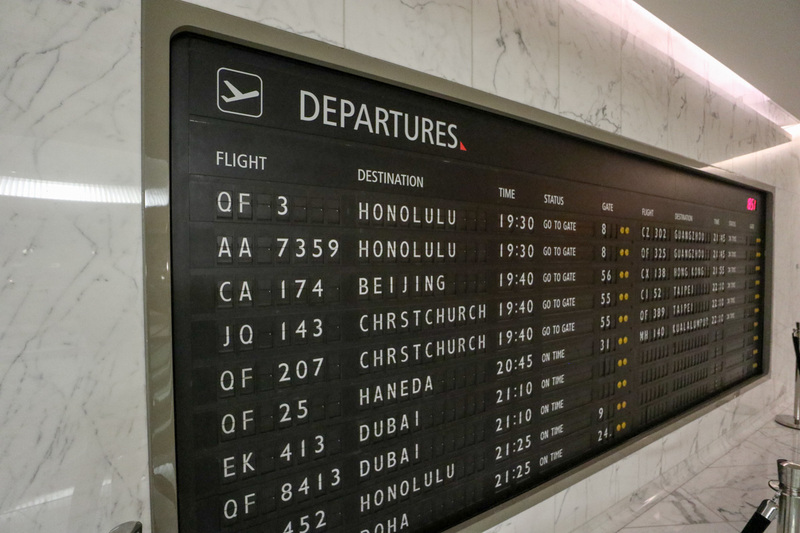 At the top of the escalators is the main reception desk, which is next one of the iconic features of the Qantas first class lounge: the nostalgic departures board. 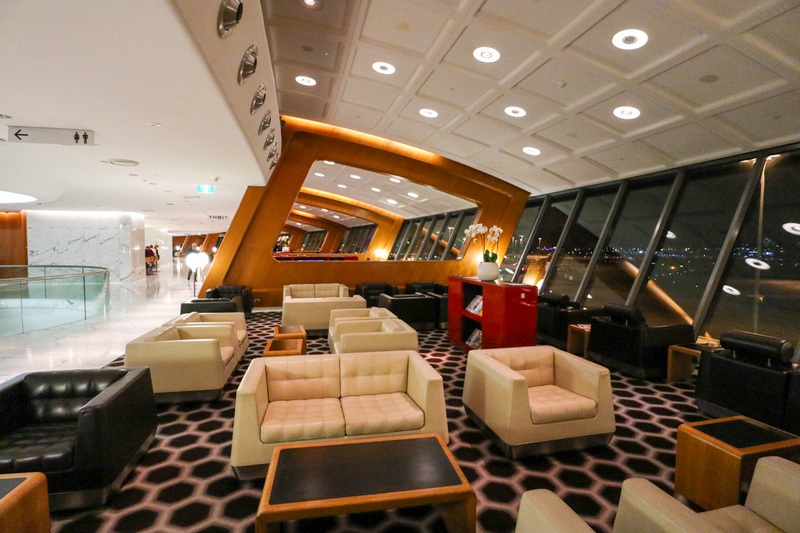 The lounge stretches the entire upper level in an arc-shape, with floor-to-ceiling windows facing the tarmac on one side and all the facilities/amenities along the opposite wall. 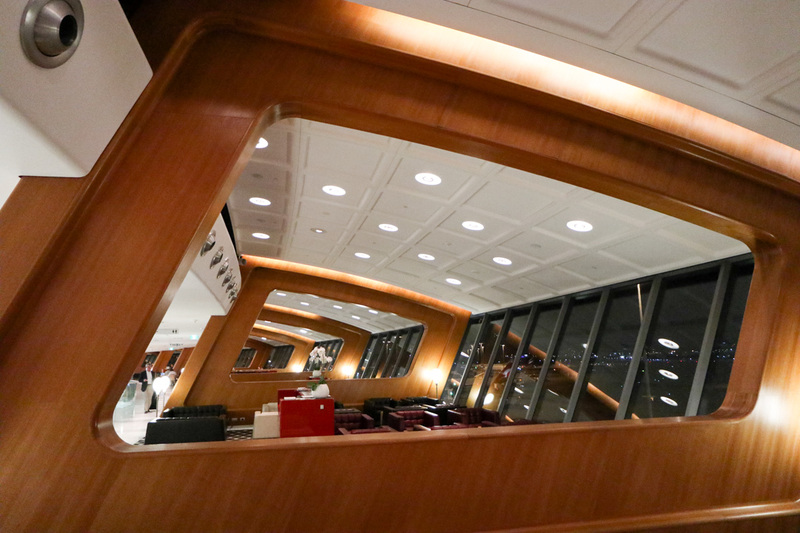 The lounge is separated into separate zones by these impressive-looking wooden dividers. 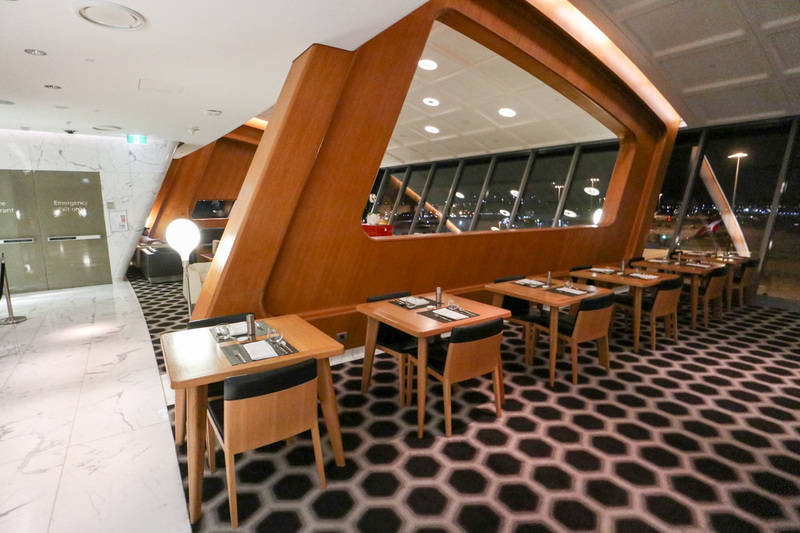 On the northern end of the lounge are the dining zones and bar. 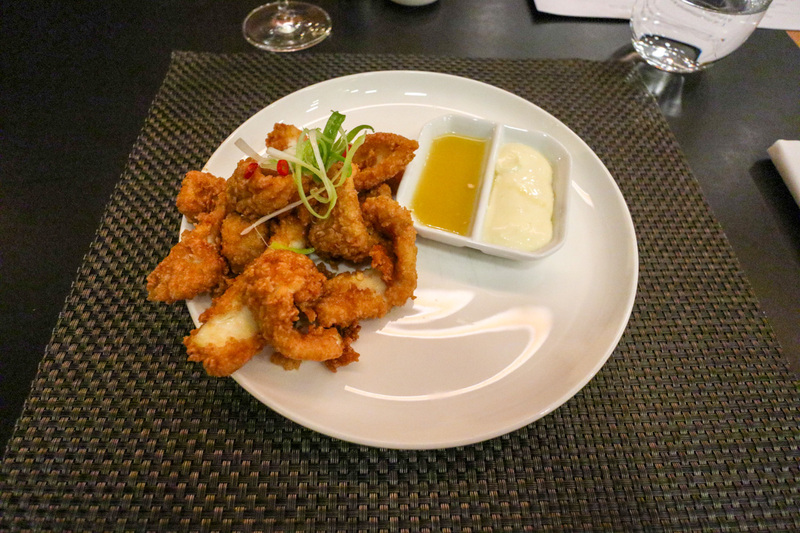 No trip to the first class lounge would be complete without a serving of Neil Perry’s Salt & Pepper Squid. 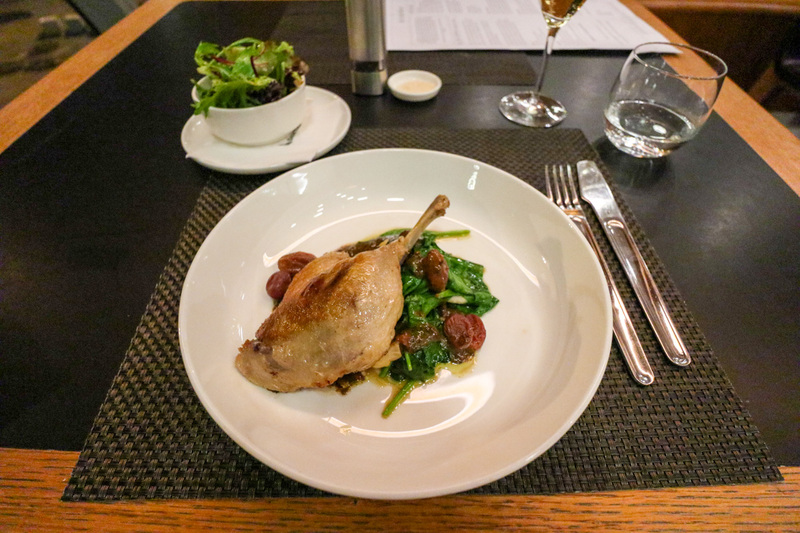 For a main, I opted for the duck and skipped dessert knowing another three courses awaited me on the aircraft. 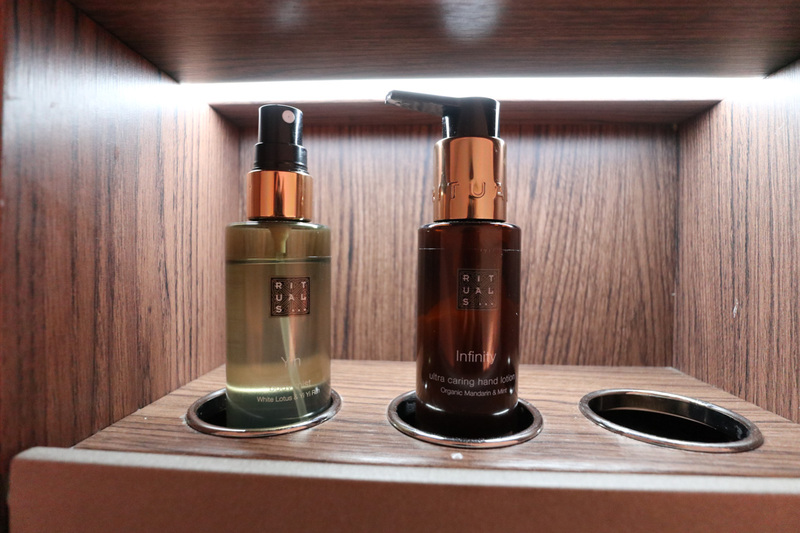 There is a spa facility onsite, but it’s only open between 8am-4pm. At the southern end, you’ll see several lounge and work zones as well as a library. 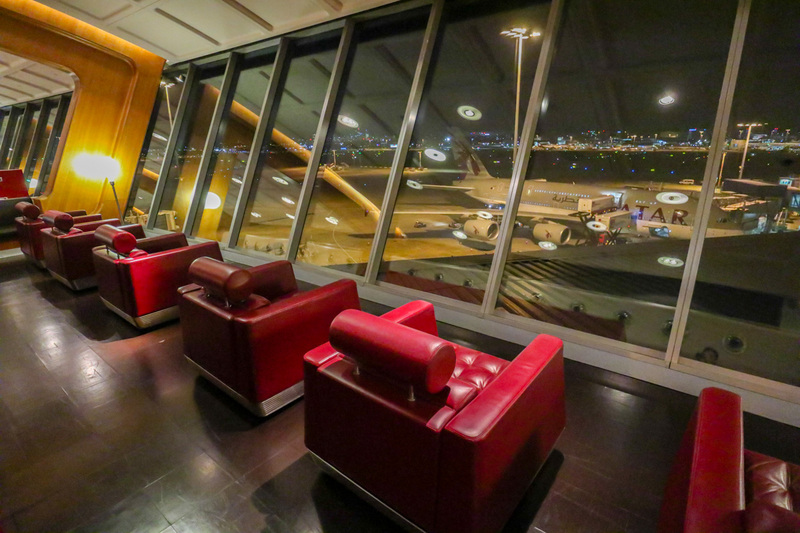 The views from the lounge are impressive, even in the evening. 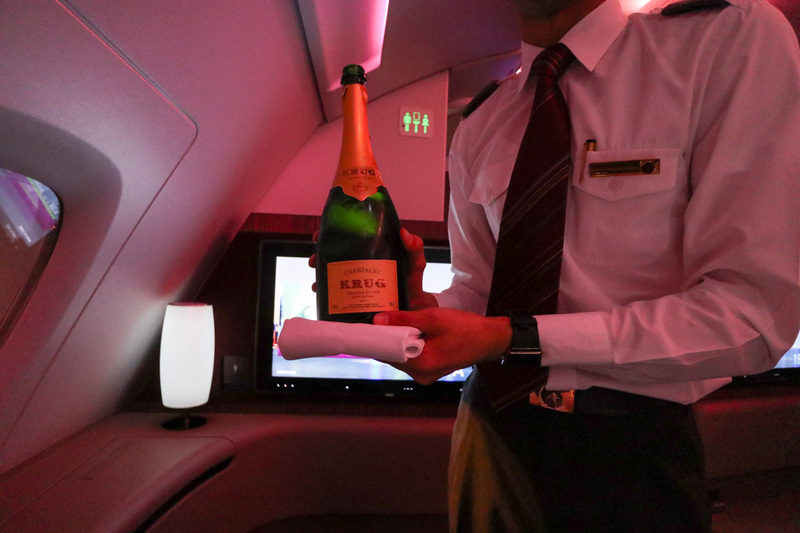 Stepping onboard, I was greeted by a cabin crew member who escorted me to my seat and asked if I wanted a hot or cold towel and a glass of Krug white champagne or Billecart-Salmon Rose champagne. Decisions, decisions! 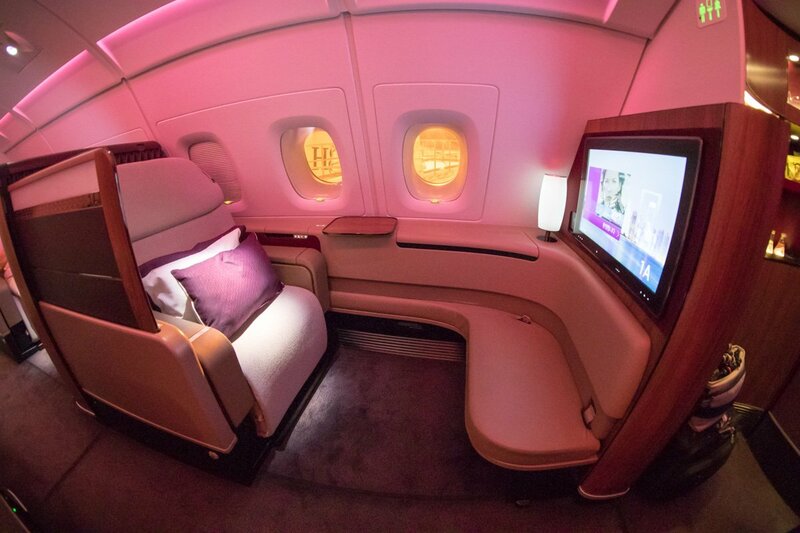 The cabin is beautifully decorated with splashes of Qatar’s signature burgundy contrasting with the light grey fabric seat. 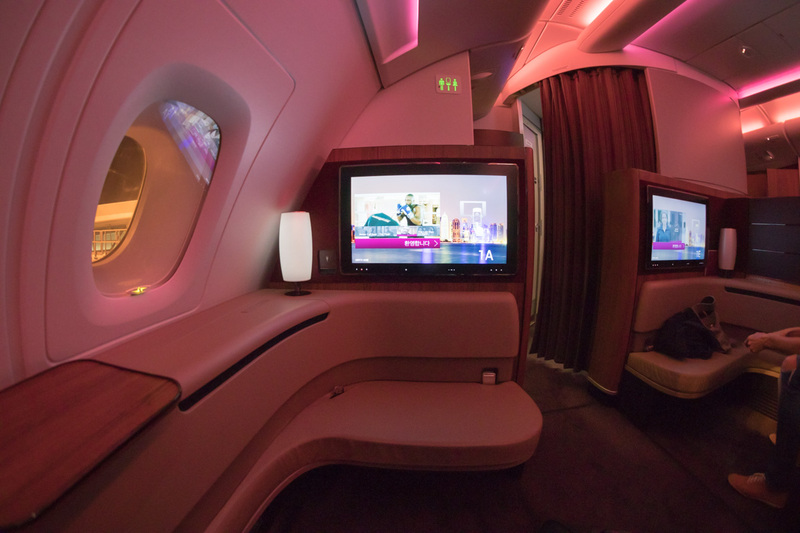 Though the pink lighting is calming, it makes onboard photography a bit challenging! 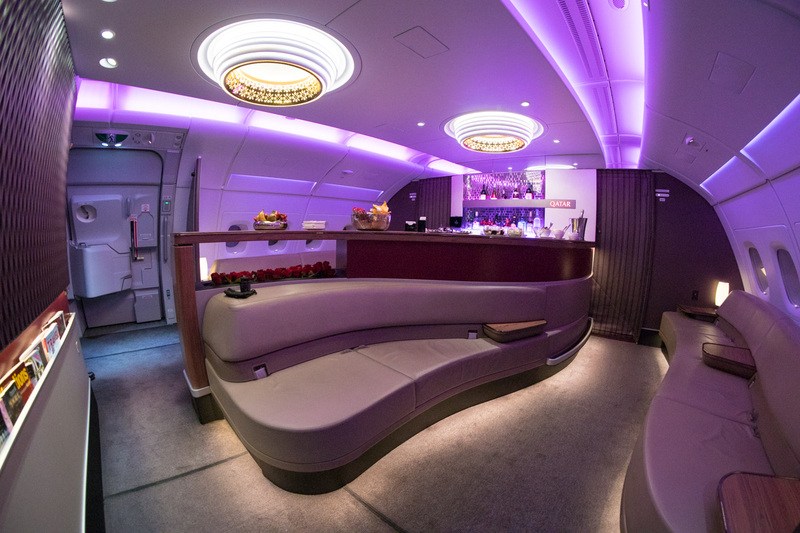 You’ll see a limited use of gold, unlike the cabin of one of Qatar’s Middle Eastern neighbors. 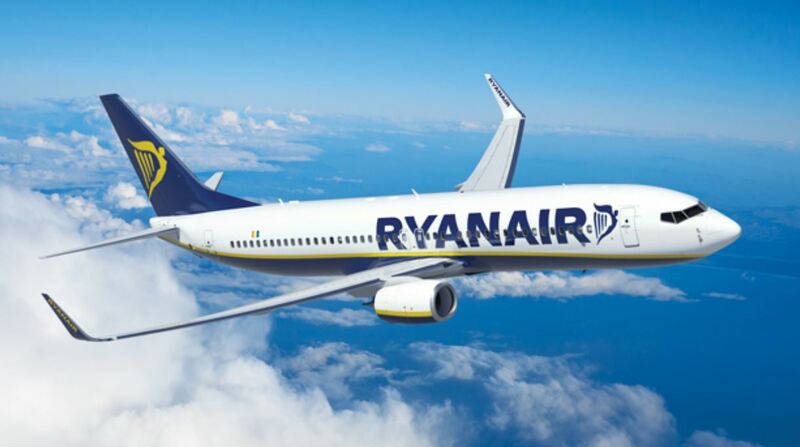 You’ll immediately notice how large and open the cabin is as there are no overhead bins (which also contributes to the lack of storage around your seat). My cabin bag couldn’t fit under the ottoman, so it had to be stored in a cupboard located on the other side of the 1A bulkhead. Although it’s near enough, you’ll have to reach over and rearrange other passengers’ bags if yours has been pushed to the back. Taking your seat, you’ll notice the other downside of the open cabin design is a lack of privacy. The crew must be aware of this since they leave the privacy partitions raised at time of boarding. Even with it up, though, I still felt exposed to the aisle whenever passengers would walk to/from the bathrooms. Preset positions for sleeping and takeoff/landing are located on window-side seat arm. 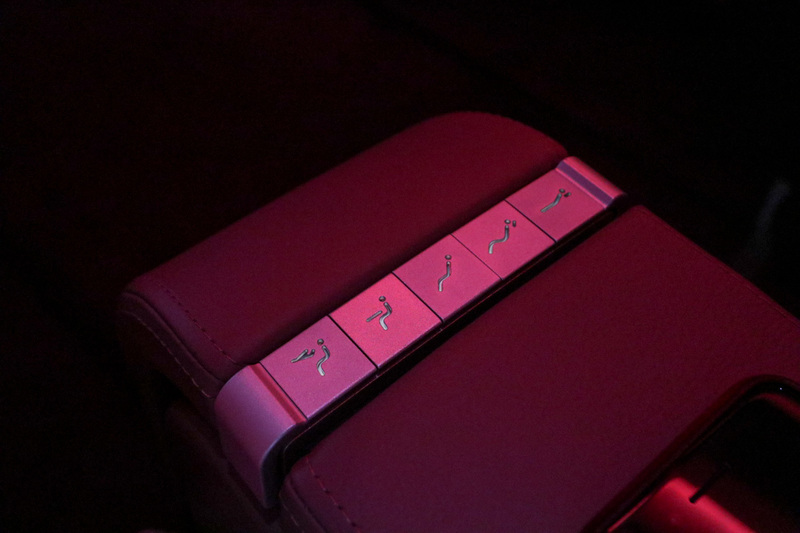 Within this armrest is the IFE remote. 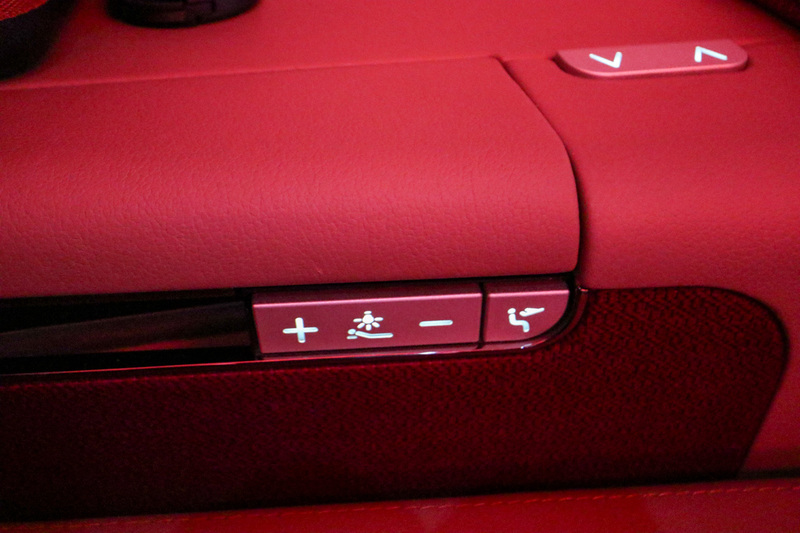 Additional seat controls are located on the aisle-side arm. 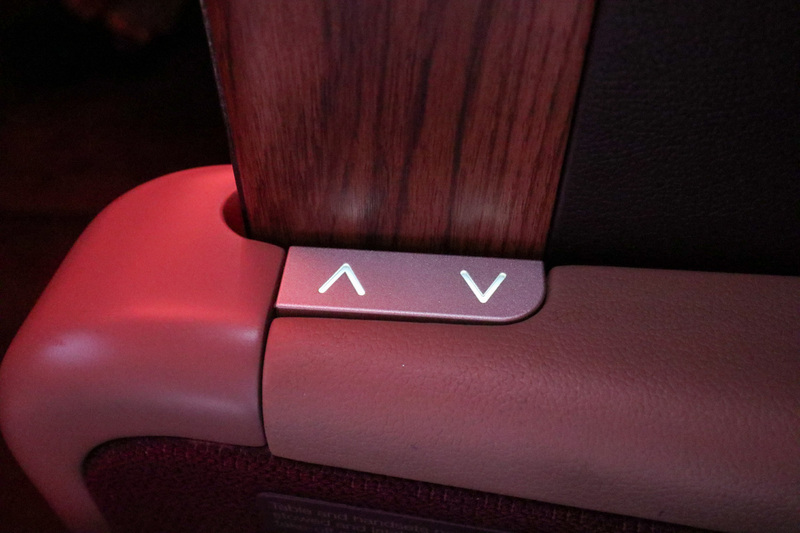 Within this armrest is a touchscreen to adjust seat presets, privacy, and lighting. The privacy screen can be electronically adjusted, but I think it’s best it stays up. 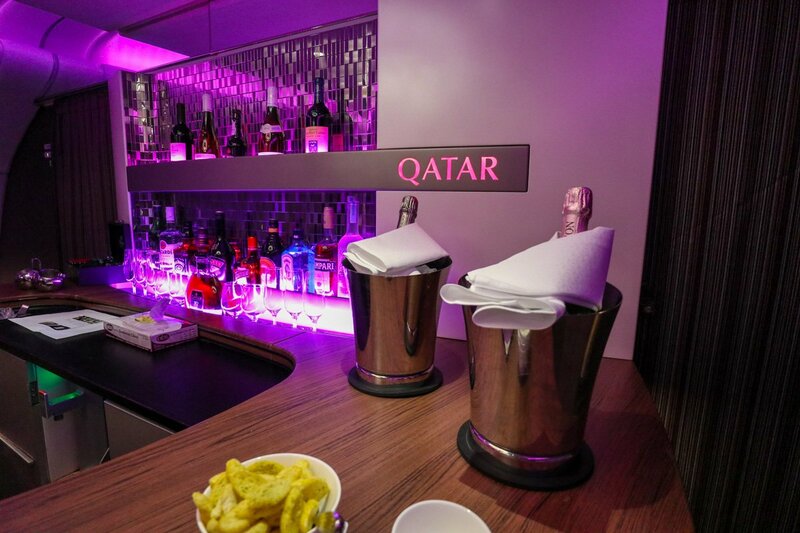 The standout feature on the Qatar Airways A380 is the bar, which is located behind the 48 seats in the single business class cabin. 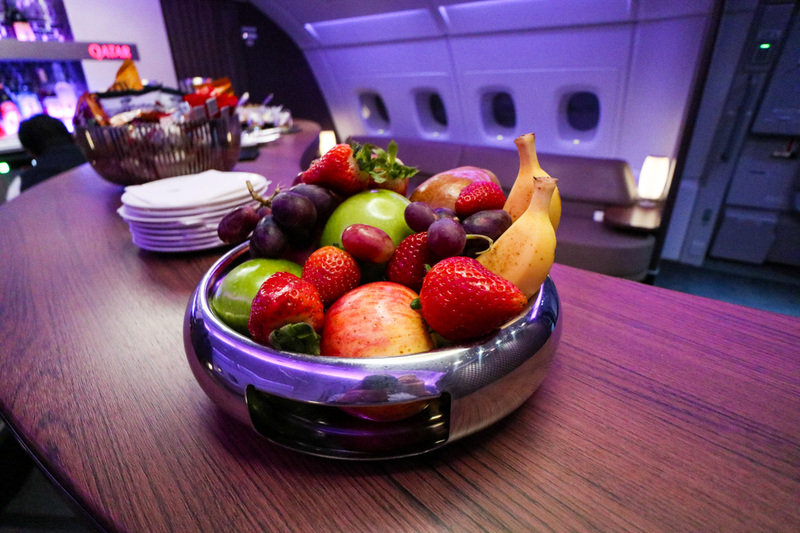 I headed straight to the bar after takeoff hoping to get some photos before other guests arrived. I was met by a crew member who was still setting everything up, and he insisted I waited until he’d finished before taking snaps. Everywhere you look, the attention to detail is incredible, from the tactile waffle pattern on feature walls to intricate lighting and mirrored splashbacks. The crew member demonstrated to me how they set up roller blinds to hide the aircraft doors in an attempt to mask the fact you’re even in an aircraft. 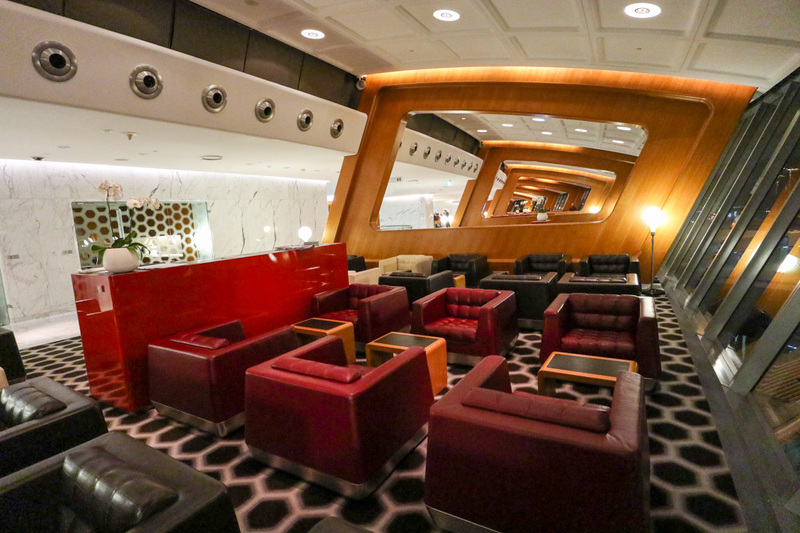 I’ve been incredibly fortunate to experience the Emirates A380, Virgin Australia 777, and Etihad A380 — without a doubt, this is my favorite aircraft bar! 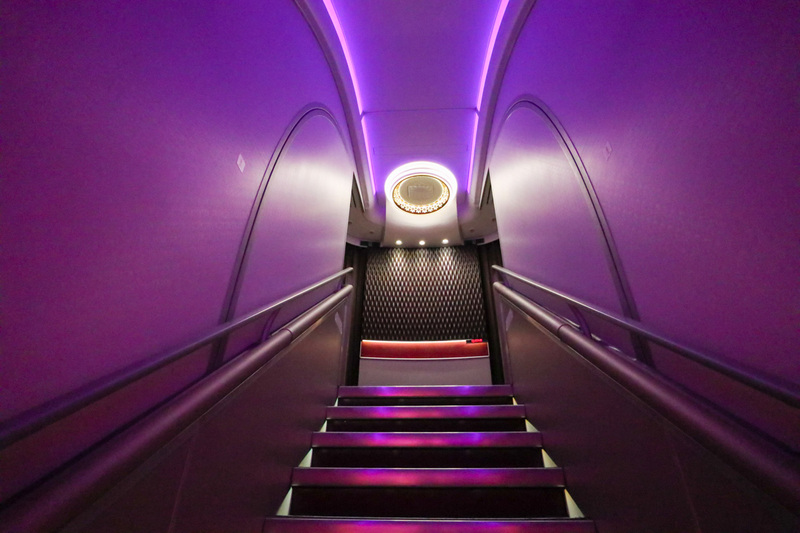 The staircase is another stand-out feature, though it’s forward of the first class cabin — seems a shame that hardly anyone would actually see this space. 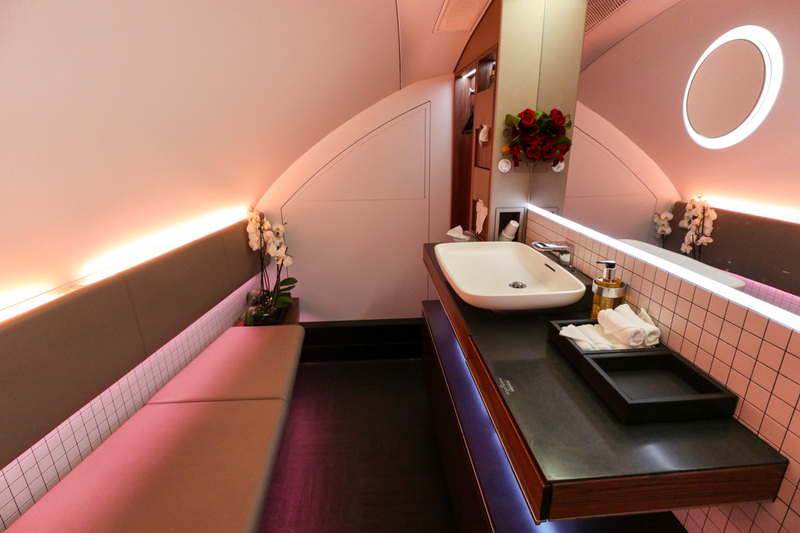 Like the rest of the first and business class cabin, the bathrooms are also beautifully decorated. But unlike its Middle Eastern neighbor airlines, Qatar Airways didn’t opt for showers in the bathrooms. 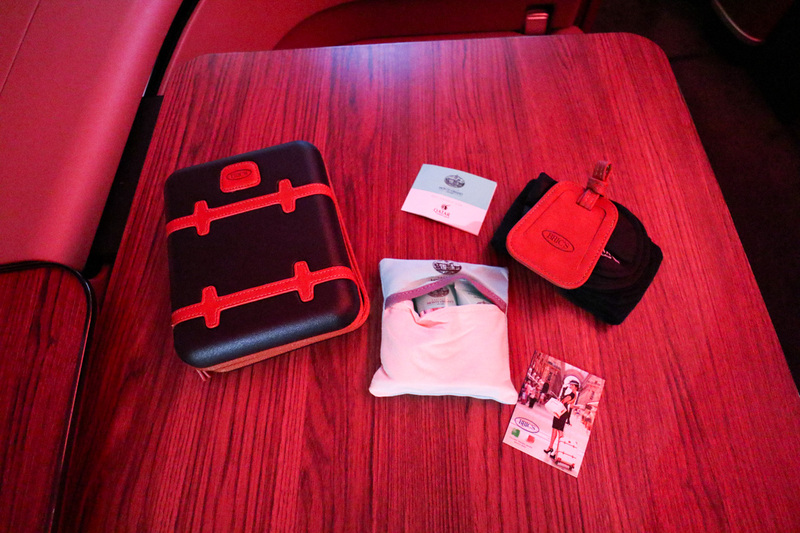 A Bric’s amenity kit is provided, which includes a leather luggage tag, socks, and eyeshade, as well as Castello Monte Vibiano Vecchio facial mist, cream, anti-aging moisturizer, and lip balm. 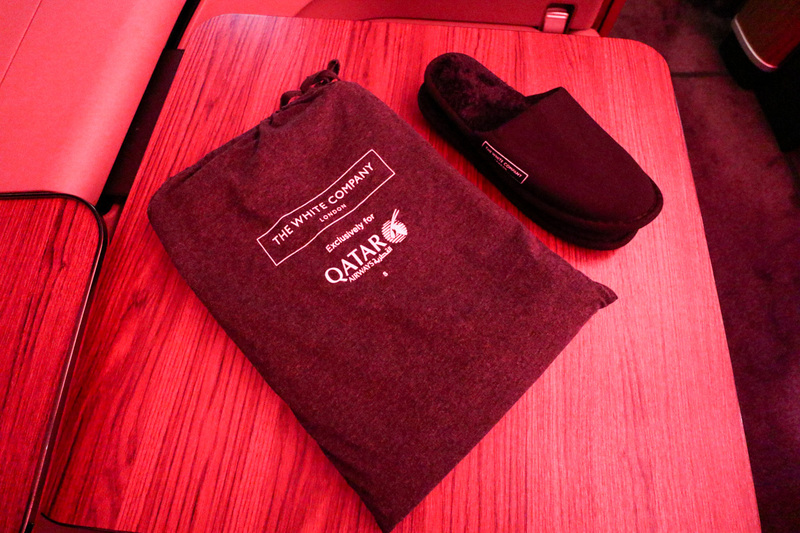 Pajamas and slippers are provided by The White Company. 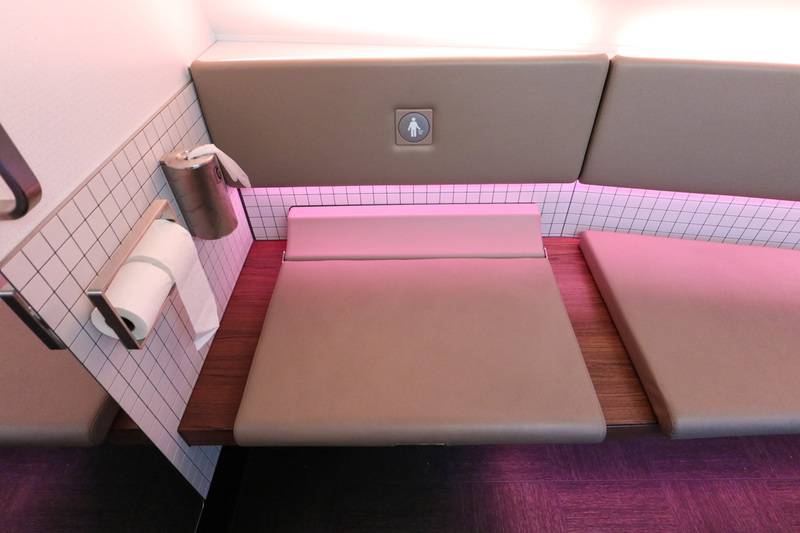 Following the meal service, I had my seat converted to a bed complete with beautiful linen and a duvet. I managed to get over 6 hours sleep on the comfortable bed, even though the cabin was a bit too warm for my liking. The meal choices were extensive! It makes me wonder how they cater such a vast menu for just 8 passengers. 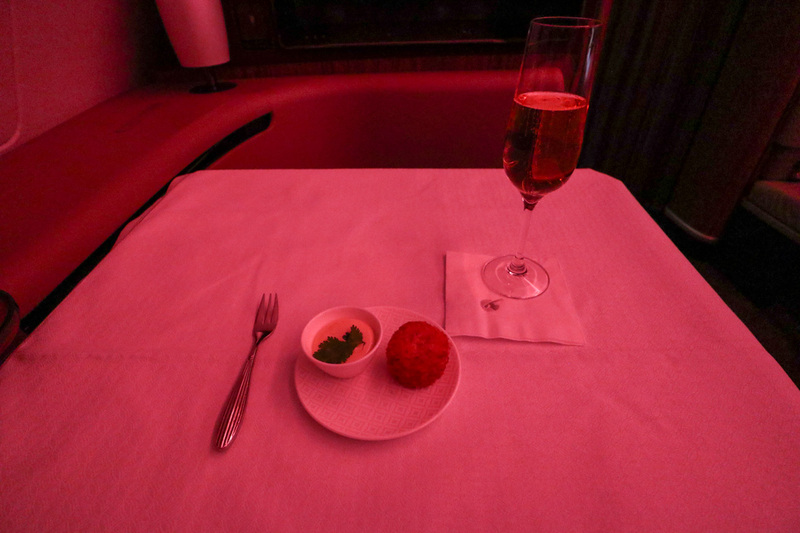 Service kicks off with an amuse-bouche: an arancini ball, which was quite stodgy on the inside. I couldn’t pass up the caviar served with a selection of accompaniments and a choice of blinis or melba toast with some more Krug. 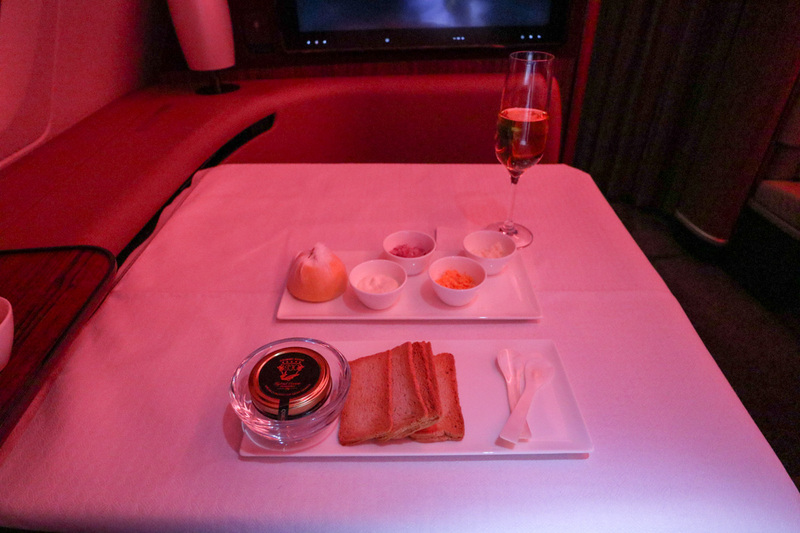 Qatar Airways uses a mother of pearl spoon instead of silver-plated utensils, which may impact the flavor of the caviar. It’s great to see Qatar Airways using several Australian proteins on this flight departing Sydney. I decided on the Australian beef, which was sadly overcooked. I paired the steak with the Chateau Picon Longueville 2008 from Bordeaux France. 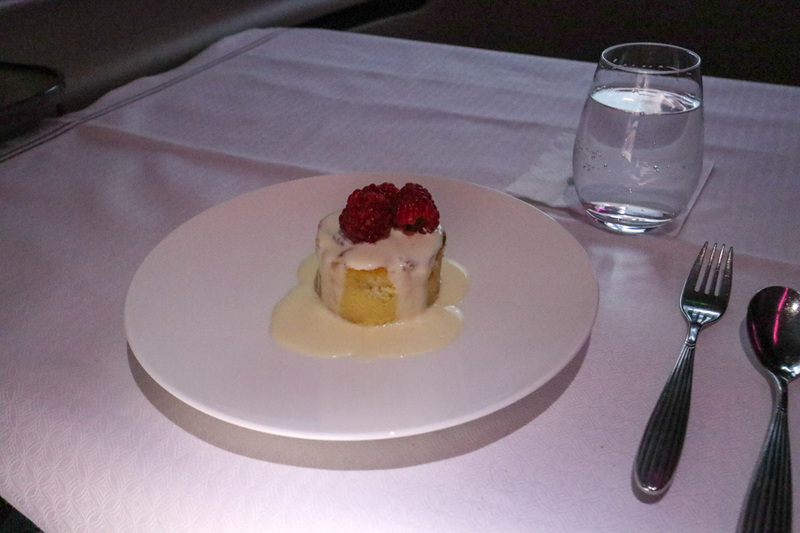 The brioche pudding came out looking a little sad the way it was plated, and the taste was unmemorable. I opted for the bircher muesli to start, which was followed by scrambled eggs. Unfortunately, the eggs were as dry as my steak. 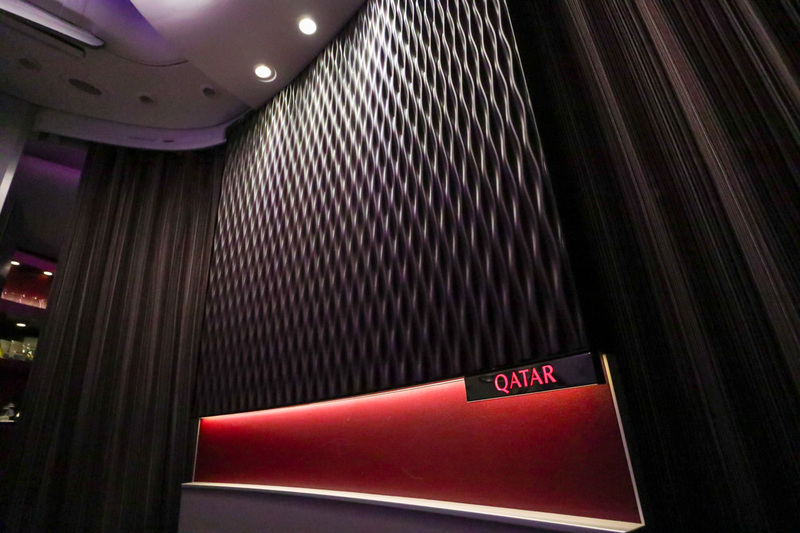 The Qatar Airways Oryx One inflight entertainment system has over 4,000 entertainment options including movies, audio, television, and games — you definitely won’t get bored. 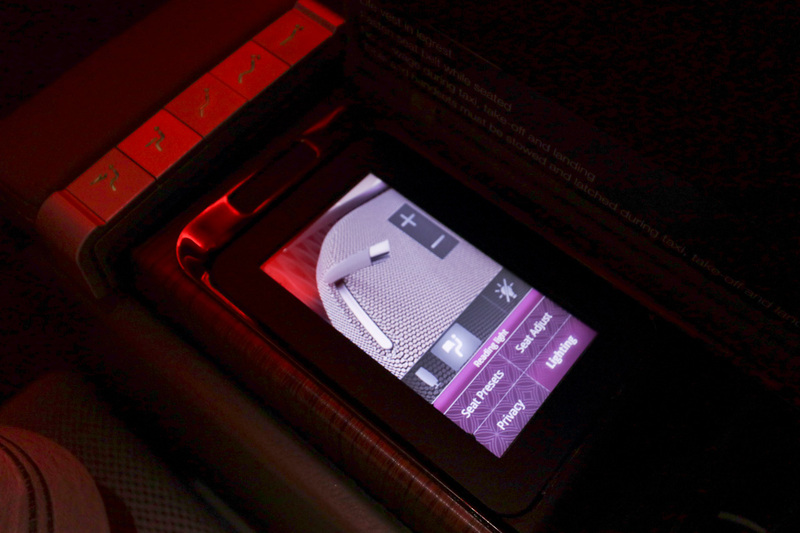 Seeing as you sit some distance from the IFE monitor, you need to control it using a touchscreen remote. My remote was frustratingly buggy and unresponsive. While scrolling, it would sometimes jump through faster than the scroll, but other times would freeze and stop scrolling altogether. The biggest disappoint on this flight was the service. The crew members serving the first class cabin seemed quite inexperienced, and the delivery of service felt robotic. 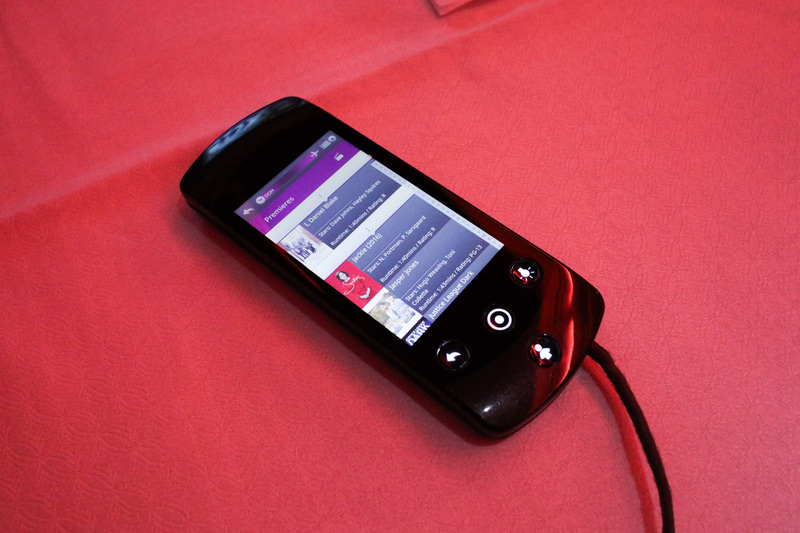 I knew that Qatar offered first class passengers free access to the Wi-Fi, but none of the crew did. They asked the purser, who said she would get back to me with a voucher. After asking 3 times, I just gave up. The lack of experience may have also explained my overheated and poorly prepared meals. 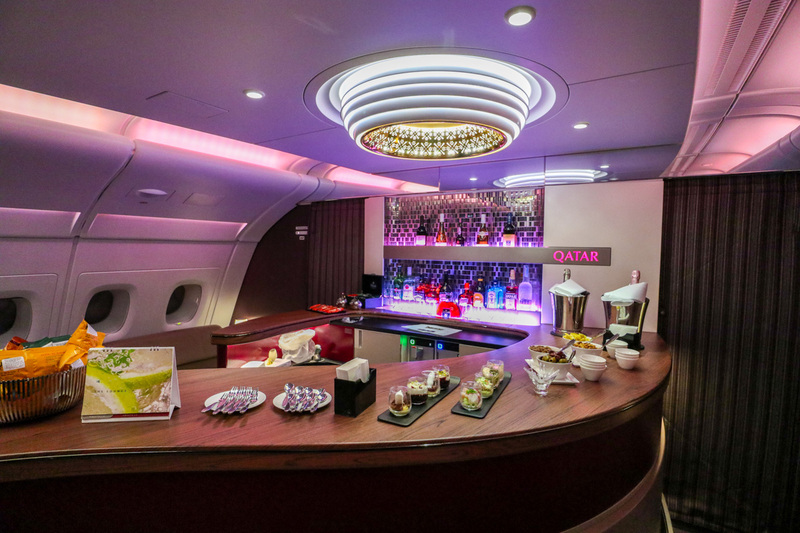 Based on previous reviews and feedback, I had high expectations of the Qatar Airways experience — but unfortunately my first time flying Qatar Airways didn’t live up to those expectations. 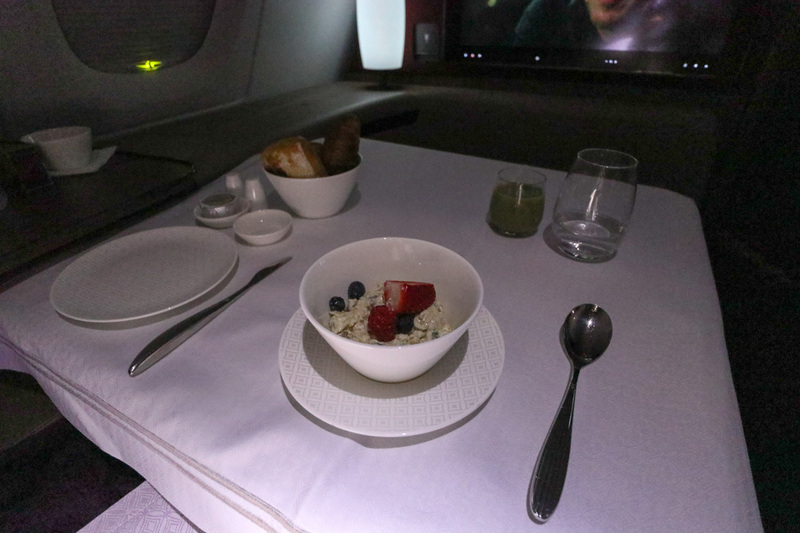 The hard first class product isn’t competitive: the seat offers limited privacy and storage, my IFE remote was buggy, the crew seemed inexperienced, and the meals were poorly prepared. Don’t get me wrong: this was a good flight, and I’m incredibly fortunate to have been able to experience it. 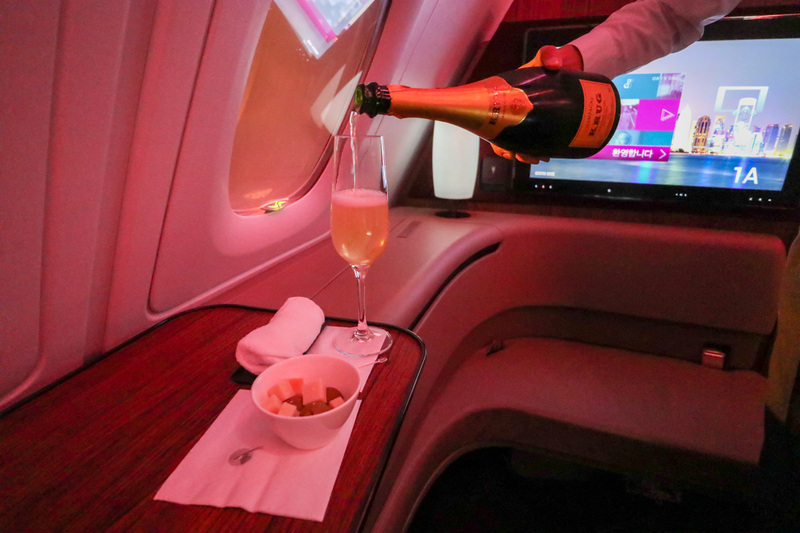 But when you’re spending this amount of points (or dollars) for a first class experience, it should be beyond perfect. 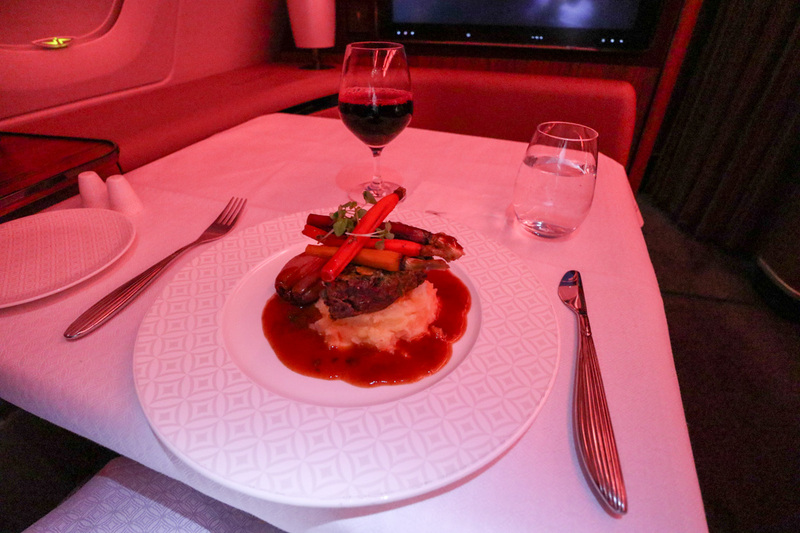 The best part of my experience was hanging out in the onboard bar to chat with fellow passengers and crew after the meal service, but this isn’t an exclusive feature of first class. 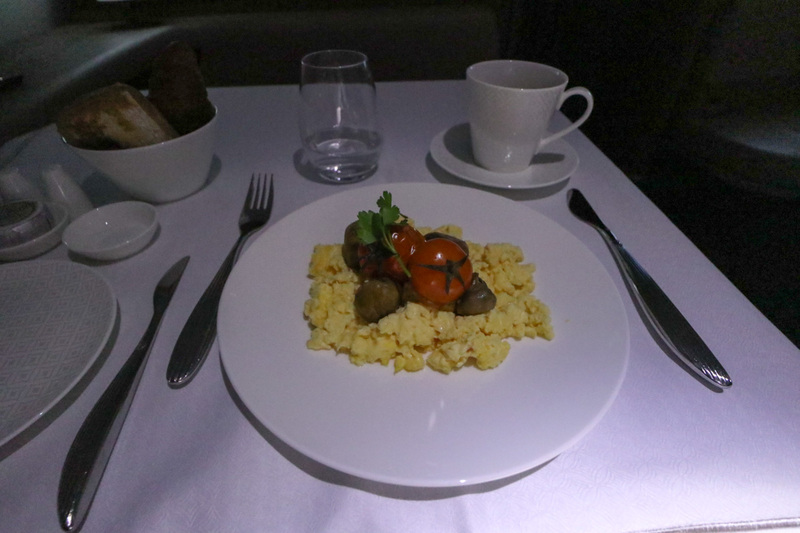 My subsequent A350 business class flight was actually better than this one thanks to an attentive, professional crew and perfectly prepared meals. 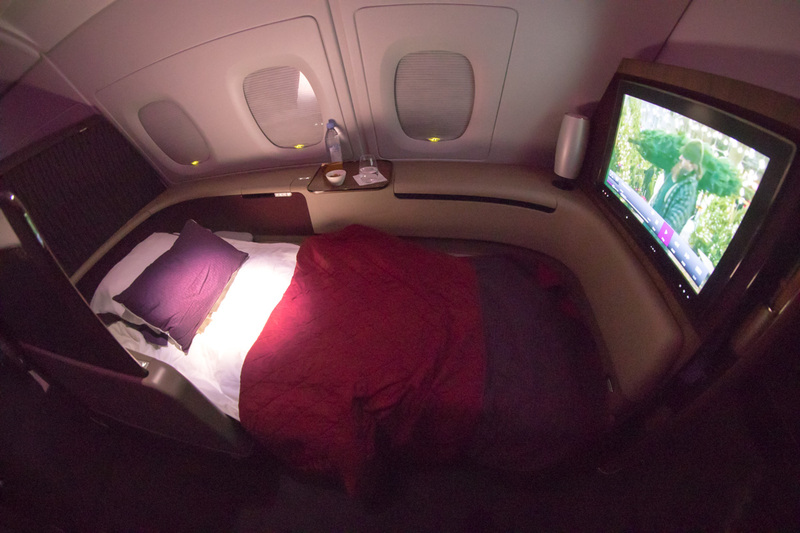 I’ll have no hesitation flying Qatar Airways again, but I’ll save my points and opt for business class next time. 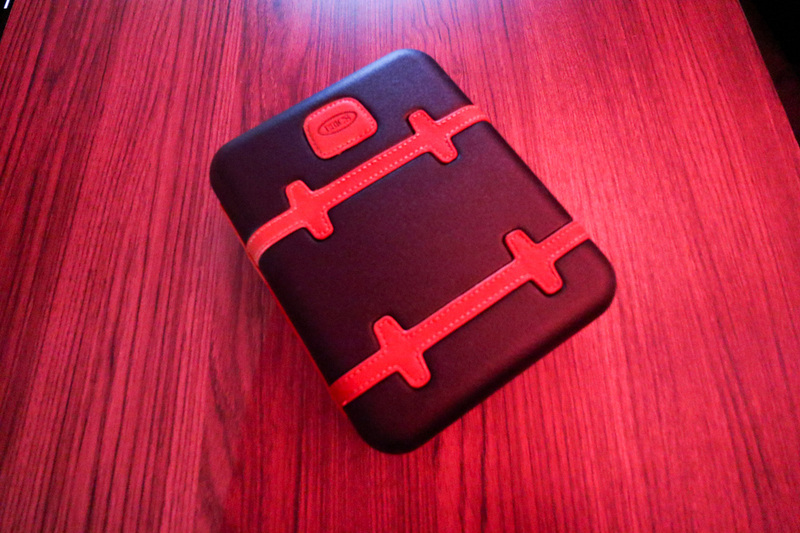 I’m really looking forward to trying the Qsuites early next year.